Manjari Sharma on creating a photo series featuring everyday people as deities. 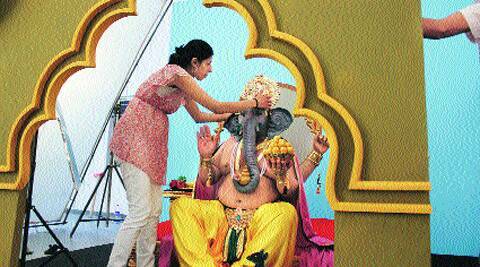 Manjari Sharma prepares for the photo shoot of Ganesha. Lights are dimmed. Mild incense smoke envelopes the room. Spotlight falls on massive photographs of Hindu gods and goddesses in hammered brass frames. Bejewelled, they wear elaborate costumes, but artist Manjari Sharma points out that the deities aren’t celestial. They are everyday people with regular jobs — Lakshmi is a flight attendant, Ganesha is a priest and a body builder plays Hanuman. The Brooklyn-based Indian artist has a mission; to find god among people. Last year, when she first exhibited her series “Darshan” at ClampArt in New York, the white cubicle felt more like a temple. The sanctum had photographs, not idols, of deities. Now sharing space with Raja Ravi Varma prints at the Asia Society in Texas, the collection has won Sharma the Curators Choice award from The CENTRE (non-profit organization to support photographers) and an award from the Hindu American Foundation. “It’s an honour to be chosen among such talent,” says Sharma. Even as congratulatory calls pour in, the 34-year-old recalls the inception of the series, which she says is rooted in her frequent visits to temples as a child and exposure to television series such as the Ramayana and the Mahabharata. “I realised not seeing religious photos recreated with exact details; it was always an idol or a painting in the temple. With a blank canvas you can paint as many details as you want, but with a photo you are physically creating and setting every part and piece of the puzzle. I wanted to do that,” says the photographer. Some months later, she was in Mumbai, her hometown, materialising her idea. A team of people needed to be put together, from the carpenter to mason, set designer, painter, sculptor, costume designer, makeup and prosthetics artist. “It’s now a team of more than 35,” says Sharma. The process starts with conceptualisation and research, where the photographer ponders over hundreds of portrayals of a deity, to draw an image that she wants to replicate. “Initially I was trying to source props, so I roamed through Lalbaug (in Mumbai), but the first day of the photo shoot I realised that just wasn’t working. The lotus was too small for Lakshmi to sit comfortably in, jewellery was too loud, elephant was terrible, it just wasn’t what I had envisioned,” says Sharma, who began to customise minutest accessories for the shoot. The effort paid-off. Her first photograph, of Lakshmi, was on the Forbes India cover in November 2012. Thereafter, she gathered about $26,000 (approx. Rs 15 lakh) through crowdfunding on Kickstarter to create Ganesha, Shiva, Durga and Hanuman. Vishnu, Saraswati, Brahma and Kali followed. Comfortable approaching people on the Mumbai streets to be part of her “Darshan” project, not too long ago the photography graduate from Columbus College Of Art and Design, Ohio, was asking people in Brooklyn to take a shower in her apartment for The Shower Series. “I came to the observation that warm water running over my subjects’ bodies relieved them of any unnerving awkwardness the camera brought about. Many of my subjects shared intimate details of their life with me and every new person in the shower became a brand new allegory,” says Sharma. As a student new to Canada in 2001, she remembers inviting people for chai. “There used to be initial reluctance but I figured that was a great ice-breaker,” she says. In the midst of another project “rooted in India”, the photographer might add one more deity to the collection of nine. “Narasimha could be interesting. There are so many gods and goddesses, it could be never ending,” she says, adding that bringing her collection to India is on the agenda. Meanwhile, narrowing down the deities in a polytheistic society is the current challenge.